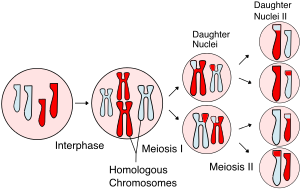 In meiosis, the chromosome or chromosomes duplicate (in interphase) an homologous chromosomes excheenge genetic information (chromosomal crossower) in the first diveesion, cried meiosis I. The dauchter cells divide again in meiosis II, splittin up sister chromatids tae form haploid gametes. Twa gametes fuse in fertilisation, creautin a diploid cell wi a complete set o paired chromosomes. Meiosis is a specialised teep o cell diveesion that reduces the chromosome nummer bi hauf, creautin fower haploid cells, ilk genetically distinct frae the parent cell that gae rise tae them. ↑ Freeman, Scott (2011). Biological Science (6th ed.). Hoboken, NY: Pearson. p. 210. This page wis last eeditit on 3 October 2017, at 19:27.